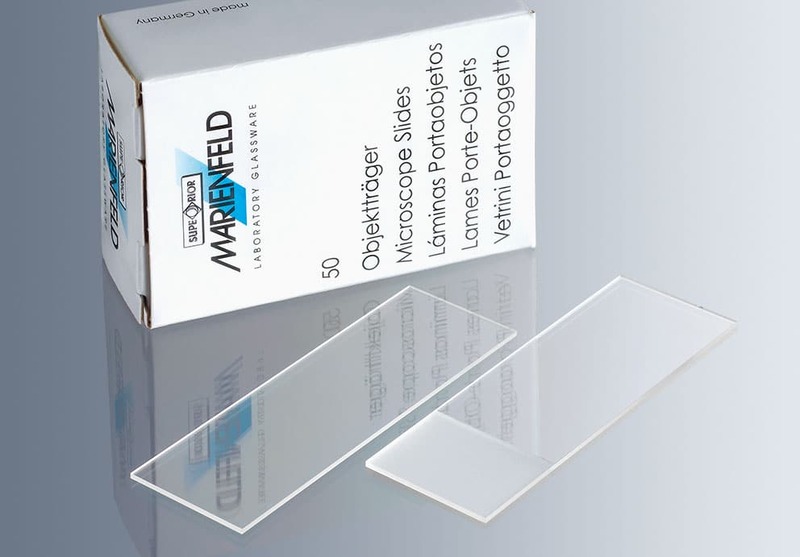 Marienfeld Superior high quality microscope slides manufactured in Germany dimensions approx. 76 x 26 mm acc.to DIN ISO 8037/1, ground edges, with and without frosted marking area. Your markings contrast especially well with the bright colours of UniMark® slides‘ printed ends. This serves to identify specimens securely. Furthermore, different colours offer the additional possibility of colour coding (for example for methods of analysis, users, priorities, etc.). The thin UniMark® coating of the marking area facilitates the processing of these slides on automated systems. Furthermore, it prevents the slides from sticking together or being scratched. The glass surface of the HistoBond® slide is loaded with a permanent positive charge which fastens securely all types of section to the glass. The glass surface of the HistoBond® slide is loaded with a permanent positive charge which fastens securely all types of section to the glass. Proteinic adhesives, which often interfere with stains and immunoreactions or have disturbing background effects, are no longer required. This improves the quality of the preparations significantly. The tissue sections adhere to the glass when subjected to frequent washing or even cooking in the microwave. In most cases, this reliable bonding makes it possible to dispense with double experiments which saves time and reduces the costs of routine section preparations in the laboratory. HistoBond®+ slides combine the characteristics of our HistoBond® line with frosted ends but are printed in various colours. Markings contrast especially well with the bright colours of HistoBond®+ slides’ printed ends. This improves the secure identification of specimens. approved for in-vitro diagnostic (IVD) applications according to IVD directive 98/79/EC, with CE-mark, recommended best before date and batch number for comprehensive information and traceability.